This is a fantastic opportunity to gain your PADI Open Water in the Outer Great Barrier Reef. The course runs over 4 days, and on completion you will be able to dive anywhere in the world! 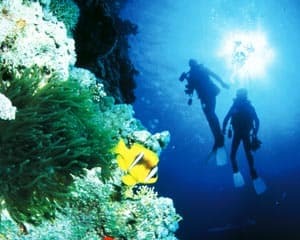 Dive the best of both worlds, 1 day on Fitzroy Island and 1 day on the GREAT BARRIER REEF. We visit reefs such as Milln Reef, Moore Reef, Thetford Reef and Briggs Reef. Please note that for the comfort, pleasure and safety of all passengers and crew all schedules reef sites, as well as the number of dive sessions, are planned on the day and are subject to weather and other conditions by the Master of the Vessel.